Dan Kovacs is a maverick investigative television reporter who launches an investigation into the mysterious death of Peter, his Pulitzer Prize-winning brother. As the clues of the mysterious murder begin to unfold, Kovacs discovers that his brother was in the midst of breaking the story of the century, an international conspiracy behind the "Mega-Bill," a nearly perfect counterfeit version of the U.S. $100 bill. But the deeper Kovacs digs, the more he discovers the roots of corruption go beyond counterfeiting currency and could trigger a nuclear war between several world powers. Now with a vast network of government agencies hot on his trail, Kovacs must uncover the conspiracy and figure out who he can trust as he fights to stay alive, keep the "Mega-Bill" out of the wrong hands, and finish what his brother started. 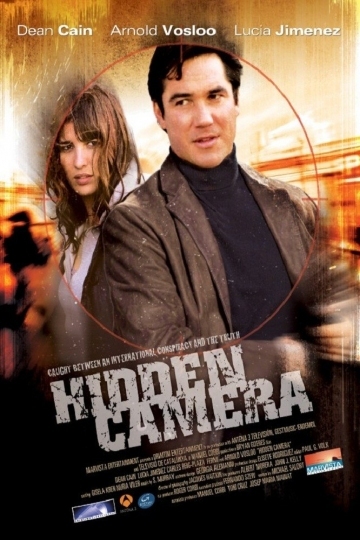 Hidden Camera is currently available to watch free on Tubi TV, Vudu Free and stream, download, buy on demand at Amazon, Vudu, iTunes, YouTube VOD online.